Rick from recursivedesign.ca sent me an interesting press release on his company's website. He says that Canadian banks do not come up very high on common local search queries on Google. Rather, some seemingly random results come back when you qualify a search locally. The conclusion is that Canadian banks are missing as many as 60 million qualified leads every year (ahem $300M in revenue) That's a lot of potential customers searching for you and not finding you. 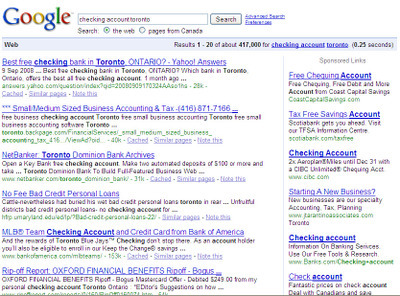 Switching to "chequing account Toronto" yields a different set of results but still not too much in the way of organic results returning all the big banks in Canada that have offices in Toronto. Searching for bank account in New York, does a much better job, but only thanks to Google doing a map for you of all the Manhattan based bank branches. What is even more shocking is that a search in French "compte de banque montreal" does a much better job it seems, but that's mostly because of the name "Bank of Montreal". Searching on "bank account montreal" yields BMO but simply because of the name "Bank of Montreal", probably not because BMO actually did anything to have them come up -- that's a pretty good accident for them isn't it? Do you see how important search engine optimization is? Call Rick to find out more at 519-993-2766 or email him at rickn@recursivedesign.ca.